You Have Got To Be Kidding Me. Central Committee Signs??? In what should be filed under the category “bizarre” we have some of the most high-profile campaigns taking place for Central Committee this year. My initial reaction when hearing about Mary Young throwing a fundraiser for her Central Committee campaign was that it must be an isolated case. Usually you pretty much throw yourself on the ballot, buy some slates, and maybe even walk precincts in your neighborhood. 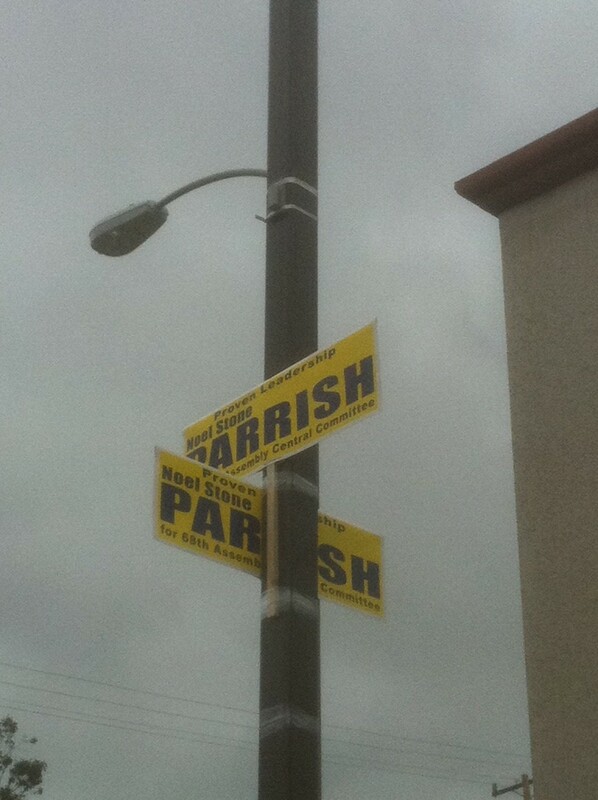 I took that picture myself in Orange at the corner of Tustin and Lincoln but I have seen these signs in other parts of the district as well. Most people believe that signs are not really all that effective, but in a crowded field of incumbents and all kinds of elected officials running in AD 68 this might be a great tactic. Nobody will truly know what impact the different strategies used this election will have until election night, but I have to admit that Central Committee will be one of the more interesting items on the ballot this June. Now that I have seen signs, I wonder when I see my forst 12 x 15 mailer for AD 68 Central Committee this year. This entry was posted on May 1, 2012 at 8:38 AM	and is filed under Republican Central Committee. Tagged: Noel Stone Parrish. You can follow any responses to this entry through the RSS 2.0 feed. You can leave a response, or trackback from your own site.